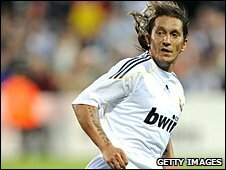 Former Real Madrid right-back Michel Salgado has signed for Blackburn. The 33-year-old, who has been capped 53 times for Spain, was available on a free transfer after Real cancelled his contract a year early. Salgado spent 10 years at the Bernabeu, winning two Champions League medals as well as a host of domestic honours. He has signed a two-year deal but will return to Madrid on Monday for a match in his honour while awaiting international clearance for Rovers. Speaking after signing his contract, Salgado said he turned down a move to Chelsea five years ago. "I had a chance to come to Chelsea but I was lucky too because my team was Real Madrid," he told the Blackburn website. "I love the club, I was there 10 years - it is a lifetime. I am proud of playing for them for so long. Should offer the bite we're sometimes lacking along with some composure on the ball, which we're frequently lacking! "Now I want to enjoy the next two years, playing in the Premier League. It is one of the best in the world. "Not only that it is pure football - fantastic games and a fantastic atmosphere. This will be a good experience for me, my wife and children. I have joined a historic club." It is something of a trademark move by Rovers manager Sam Allardyce, who gained a reputation while at Bolton for signing veteran players such as Youri Djorkaeff, Fernando Hierro and Ivan Campo. Blackburn lost their opening match of the Premier League season 2-0 to Manchester City.